R58 MINI Cooper S Coupe Brake pads, rotors, and sensors. 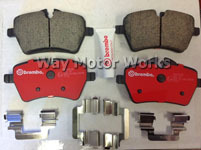 WMW has many pads like EBC greenstuff, EBC redstuff, yellowstuff, Akebono Ceramic, MINI OEM pads, Hawk, ATE, and more. Plus brake rotors from ATE, Zimmerman, Brembo, Stoptech, MINI OEM, and EBC brakes.